“Well, let’s just name the starting quarterback and get it over with,” Chris Petersen said sarcastically, sitting in front of a purple backdrop inside Husky Stadium’s Touchdown Terrace on Friday morning. “Who is it?” a media member asked. But alas, Petersen — a former quarterback at Sacramento City College and UC Davis — is, in fact, out of eligibility. 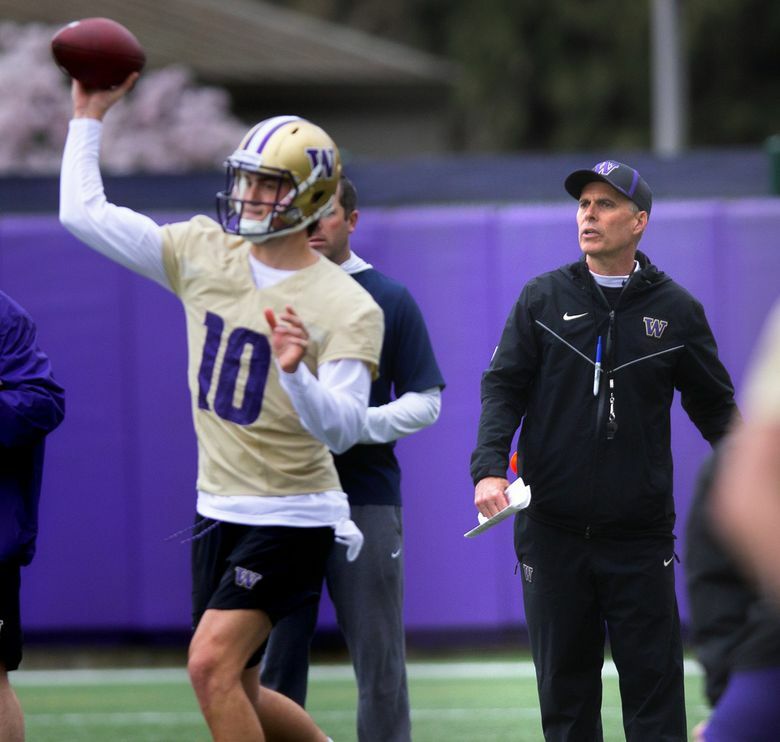 His five scholarship signal-callers this spring — junior Jacob Eason, sophomore Jake Haener, redshirt freshmen Jacob Sirmon and Colson Yankoff and early enrollee freshman Dylan Morris — are six practices into a quarterback competition that promises to stretch well into the summer. Granted, Eason and Haener have taken the vast majority of the first-team reps during spring practice, and Eason — a former five-star prospect and Lake Stevens standout — is the overwhelming favorite to start against Eastern Washington on Aug. 31. But they continue to split starting snaps. And if Eason is the presumed starter, Petersen is certainly not prepared to say it. Still, the sixth-year Huskies head coach acknowledged it’s difficult to build skill (and momentum) with so many signal-callers and so few available reps.
“It’s great if you have a starter and he’s going to get some really good reps – probably not enough, still, unless we’re in the NFL where that guy takes every rep, which we don’t do that in college football,” Petersen said. Speaking of “every position,” here are a few more notes on the rest of the Huskies’ roster. The most impressive player through six practices this spring, according to Petersen, has been an early enrollee freshman. “There’s been nobody that I’ve been more impressed with than Cam Williams,” Petersen said of the freshman safety, when asked to comment both on Williams and linebacker Josh Calvert. “I mean, he shows up every day. You go back and put the tape on and even if it’s wrong, he does it full speed and it’s the right technique. It might be the wrong assignment, but there’s not a lot of that. For Williams, purpose has met opportunity early in the spring. Bolstered by UW’s lack of depth at the safety position, the 6-foot, 185-pounder has made himself a mainstay beside converted wide receiver Alex Cook on the second-team defense. For each of the past three practices, defensive coordinator Jimmy Lake has set junior Brandon McKinney and senior Myles Bryant as the starting safeties. But should Bryant shift back to his customary nickel spot, Williams could foreseeably challenge for starting reps. Regardless, the Bakersfield, Calif., product seems primed for a contributing role this fall. Elijah Molden and Brandon McKinney collided. For a second, practice stopped. The UW starting defensive backs were simultaneously tracking an errant pass from freshman quarterback Dylan Morris, which whizzed past wide receiver Chico McClatcher. Instead, they found each other. Fortunately, after tacking a couple moments to gather themselves, both Molden and McKinney returned to practice. But it could have been worse. And it should have been avoided. “It goes back to poor football on the offense,” Petersen said. “The defense had the collision, but we can’t throw balls like that. That’s an ill-advised throw. You’re going to get somebody hurt like that. But, you’ve got to make mistakes out there to correct them. We’ll learn on the other side of the ball. Two of Washington’s starting wide receivers — senior Aaron Fuller and junior Ty Jones — are sitting out this spring with injuries. But there is still no shortage of bodies for first-year wide receivers coach Junior Adams to tutor. And one of the pleasant surprises through six practices this spring has been redshirt freshman Austin Osborne. Osborne — a 6-2, 198-pound receiver from Rancho Santa Margarita, Calif. — most notably hauled in a 48-yard touchdown pass from Haener earlier this week. “I think Austin is really progressing,” Petersen said. “I know Austin is going to be a good player for us. He’s smart and he did some really good things in high school and played at a high level. So he’s one of the guys I really want to see take that next step where everybody starts noticing. Some of these guys, you notice little things. But they need to turn heads with everybody making plays. Another of those guys is McClatcher, who temporarily left the team last season for personal reasons. Now the 5-8, 184-pound senior is back and has practiced primarily with the second team this spring. Still, McClatcher has piled up a series of acrobatic catches and seems to have the same explosiveness that allowed him to lead the Pac-12 in yards per reception (18.5) in 2016. And more importantly, McClatcher’s mindset also has improved. “He’s lightyears ahead (of where he was when he left the team),” Petersen said. “When he stepped away he needed to get away and refresh and get things in perspective. But he’s been great since he came back.